We spent Tuesday at the Occupy Wall Street site in lower Manhattan, a stone’s throw from ground zero. For those of us old enough to remember such gatherings in the so-called Sixties (’64-’74), the similarities were striking: spontaneity, solidarity, earnestness, and, of course, dissatisfaction with the status quo. But equally striking was the difference: 40 years ago, the causes were ending the Vietnam War and extending civil rights — for African-Americans and, after a few years, women (though rarely to those of alternative sexual preference). Occupy Wall Street, by contrast, was mainly about the dismal state of today’s economy. Even if you’d spent an entire career since the Captain and Tenille last won a Grammy trying to make sense of The Dismal Science, as I have, you’d have found the proposed solutions daunting. Into my hands was thrust a leaflet asserting “JUSTICE = NATIONAL DEBT REPUDIATION = LIBERTY = FUTURE PROSPERITY” and urging the creation of “a global political party uniting the younger generation.” Another simply itemized a “List of Demands” – 36 of them. Guaranteed employment for all Americans. Increase in the minimum wage to $15 an hour. …36. Feel free to add to this list. One woman told me the core problem was the status of the corporation as a legal person, which should be denied forthwith. But if any message united green and grey alike, it boiled down to this: the American economy is rigged — controlled by an elite which has used the political process to funnel prosperity to itself, and itself alone. Thus the alternative name for this movement of the moment: “The Other 99 Percent.” You can hear some of the occupiers for yourself on Wednesday’s broadcast. 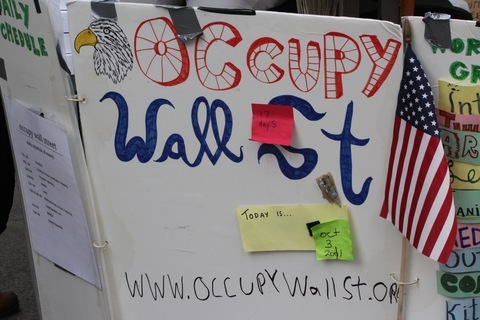 Photo of Occupy Wall Street protest sign by Jackie Weir. One final question: Why now? The country seems clearly riven when it comes to economic solutions. The Tea Party, the Republican candidates, Libertarians of all stripes blame “government” for our economic ills and prescribe what rhetorician-of-the-month Herman Cain calls an end to the “ations”: regulation, legislation, taxation. Those occupying Wall St., by contrast, think the very same “ations” have been redirected by and for the other ONE percent. But behind both movements is a devout belief: that the American economy is today failing to deliver as it has in the past and that tomorrow will compound the failure, unless we “change course.” In downtown Manhattan this week, as in Herman Cain’s speech to the Conservatives for Political Action convention back in February and elsewhere in the Republican litany, you hear the same shared article of faith: the American Dream is gone. The desperate aim of both camps is to restore it.